this is amazingly beautiful at night! wow, can someone bring me to eat? Personally I have never been to this restaurant before. 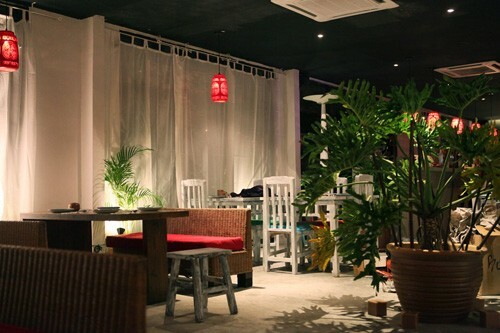 Taking a look at the pictures provided from Everyday Coupons, I am beginning to love the romantic elegance of this restaurant which appears to be a luxurious place in Jalan Ampang that open early this year. 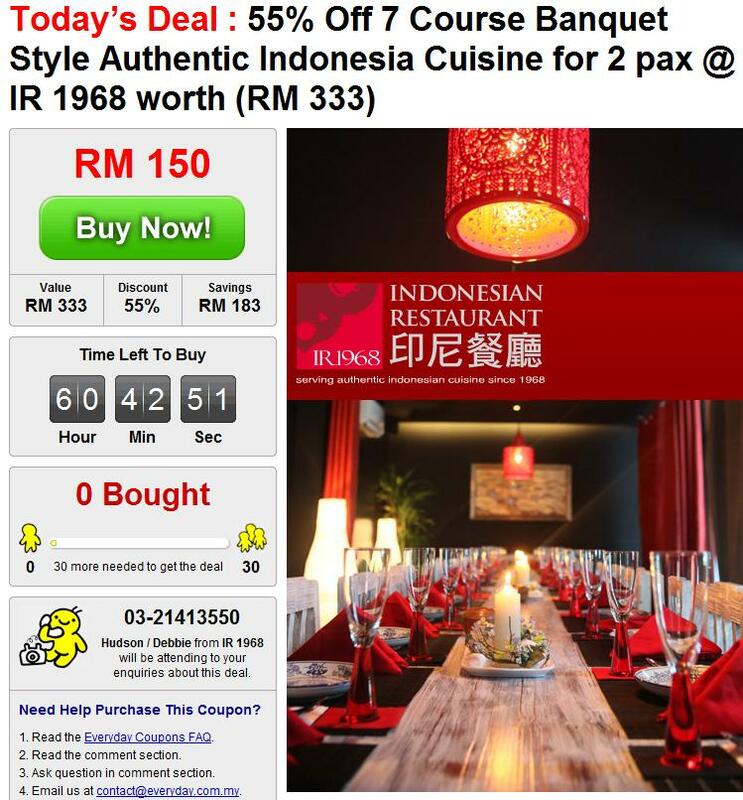 Serving authentic Indonesian cuisine since 1968, IR 1968 is a branch that originated in Causeway Bay, Hong Kong. 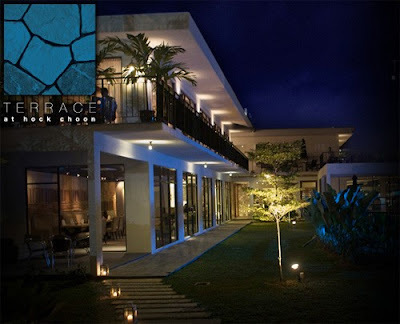 It is located at Terrace at Hock Choon (behind Hock Choon Supermarket and opposite SuCasa Hotel). Terrace at Hock Choon is a new and F&B destination featuring 4 restaurants, 3 bars and a cafe serving ILLY coffee. 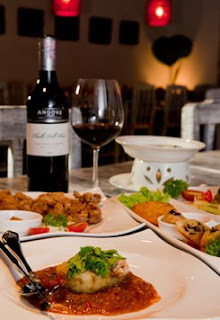 Owner Debbie Goh, a famous actress in Hong Kong and Malaysia smiles as she presents you a glass of wine inviting you to experience a truly authentic Indonesian cuisine at her restaurant, IR 1968. She has collaborated with Everyday.Com.My to give their members a 7 course Banquest Style Authentic Indonesian Cuisine for 2 pax (couples alert!) 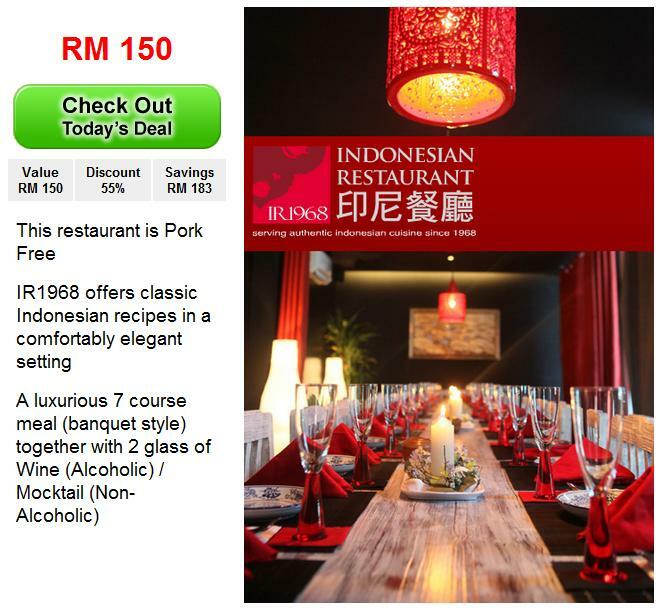 at the promotional rate of RM150 (normal price RM300++!). Check out the menu below and see if you are itching to go Indonesia this Bulan Puasa or just to experience a whole new place at IR 1968. Click here for more information regarding this restaurant and promotion. and serve with a bottle of Evian mineral water. This promotion will end in 3 days starting today. Don't wait too long to decide if you're going to bring your gf/bf here! Click here (my unique referral link) to purchase the coupon for this restaurant from Everyday.Com.My. I get a commission for each referral if anyone buys the coupon. There's short reviews from food bloggers e.g Fat Boy Bakes at the same link on this restaurant. I tried their food, went for food review session last time and I love it!! but the 7-course like not much thing that I want eat leh.. The 7 course dinner not worth it. sounds horrible... 7 dishes, each out 20mins?! complained to everyday.com.my/IR Restaurant. So sorry to hear your bad experience. I hope your complaint is heard by the restaurant. It's not cheap also the voucher.